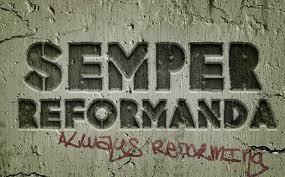 In the spirit of the Reformation motto: semper reformanda – always reforming, what say we abandon the fortresses of our traditions. This Sunday, Lutheran churches all over the world will begin their Reformation Sunday worship services vigorously singing “A Mighty Fortress” and I for one wish they wouldn’t. I suspect that the hymn’s author Martin Luther might just agree with me. After all didn’t Luther write a Mighty Fortress in an attempt to bring the popular music of the day into the church? I am convinced that this particular Reformation Sunday tradition has dear old Martin spinning in his grave at the thought that the church that bears his name is still singing a tired old chestnut like A Mighty Fortress to celebrate the Reformation. The very idea of 21st century Lutheran’s celebrating the Reformation by clinging to the events of the 16th century is an affront to the memory of Martin Luther. We should be singing this century’s music and rather than smugly resting on the laurels of the past, we should be plotting were the reformation goes from here. Perhaps in this the 21st century, when so many of the church’s traditions have seen the institution fall into the malaise of irrelevancy, we need to echo the cry: “Semper Reformanda” — “Always Reforming” the cry of the reformers who insisted that the church in every age stands in need of reformation. This entry was posted in Progressive Theology, SERMONS, Theology and tagged 95 Theses, A Mighty Fortress, evolutionary christianity, Matthew Fox, progressive christian liturgy, progressive christian sermon, progressive christianity, progressive christianity and homosexuality, Reformation Sunday, Reformation Sunday sermon, theology by Rev. Dawn Hutchings. Bookmark the permalink. Amen! Preach it, sister! 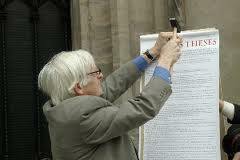 As someone who grew up in the church of Rome & after a long, long pilgrimage has found a spiritual home in the ELCA I have often thought of writing out my own 95 theses–encouraged by what I read here, I will before this Sunday. [I’ve also long wanted to update the Nicene Creed in the language of my own faith–guess it’s time to do that too! Thank you, Pastor! There is a little more air to breathe today after reading your post. Thank you, Pastor Dawn. it is grand to fill our lungs with some clean fresh air!